In the realm of marine casualties and incidents, each case has its own set of facts, cast of mariners and vessels involved and, frequently, sharp differences of opinion regarding same. The one common denominator of most marine casualties, however, is the requirement to report them to the U.S. Coast Guard (U.S.C.G.). While what defines a marine casualty is often in the eyes of the beholder/mariner, it is much more prudent to err on the side of caution and, when in doubt, report it using Form CG-2692. 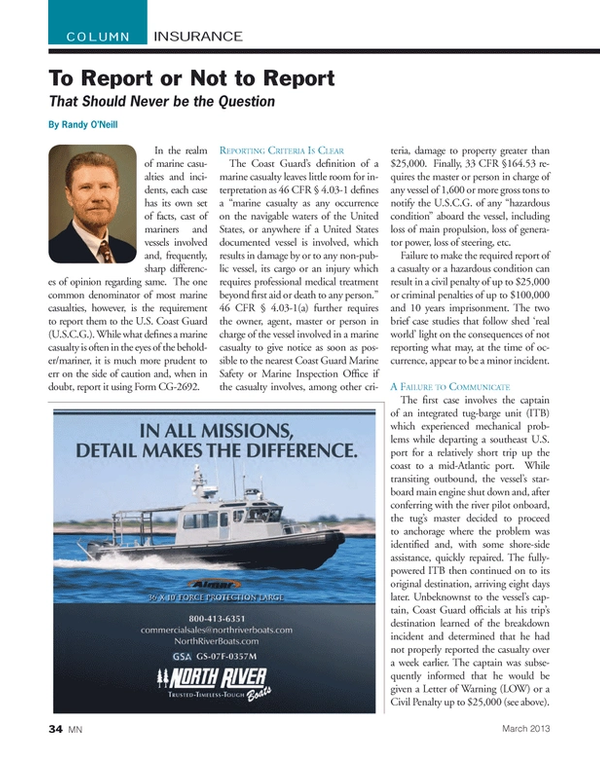 The Coast Guard’s definition of a marine casualty leaves little room for interpretation as 46 CFR § 4.03-1 defines a “marine casualty as any occurrence on the navigable waters of the United States, or anywhere if a United States documented vessel is involved, which results in damage by or to any non-public vessel, its cargo or an injury which requires professional medical treatment beyond first aid or death to any person.” 46 CFR § 4.03-1(a) further requires the owner, agent, master or person in charge of the vessel involved in a marine casualty to give notice as soon as possible to the nearest Coast Guard Marine Safety or Marine Inspection Office if the casualty involves, among other criteria, damage to property greater than $25,000. Finally, 33 CFR §164.53 requires the master or person in charge of any vessel of 1,600 or more gross tons to notify the U.S.C.G. of any “hazardous condition” aboard the vessel, including loss of main propulsion, loss of generator power, loss of steering, etc. Failure to make the required report of a casualty or a hazardous condition can result in a civil penalty of up to $25,000 or criminal penalties of up to $100,000 and 10 years imprisonment. The two brief case studies that follow shed ‘real world’ light on the consequences of not reporting what may, at the time of occurrence, appear to be a minor incident. The first case involves the captain of an integrated tug-barge unit (ITB) which experienced mechanical problems while departing a southeast U.S. port for a relatively short trip up the coast to a mid-Atlantic port. While transiting outbound, the vessel’s starboard main engine shut down and, after conferring with the river pilot onboard, the tug’s master decided to proceed to anchorage where the problem was identified and, with some shore-side assistance, quickly repaired. The fully-powered ITB then continued on to its original destination, arriving eight days later. Unbeknownst to the vessel’s captain, Coast Guard officials at his trip’s destination learned of the breakdown incident and determined that he had not properly reported the casualty over a week earlier. The captain was subsequently informed that he would be given a Letter of Warning (LOW) or a Civil Penalty up to $25,000 (see above). Three weeks after the original incident and almost two weeks after hearing from the U.S.C.G., the affected master notified his license insurer of the investigation, and the insurer (MOPS) promptly assigned a maritime attorney who made best efforts to catch up with the Coast Guard’s casualty/investigation and work with the ITB’s captain to complete and submit a CG-2629 as soon as possible. Sadly, despite solid representation and incurring almost $2,500 in legal fees, the ITB’s captain did indeed receive a Letter of Warning which, upon acceptance, became part of his permanent record. This is but one example of a truly unfortunate and unnecessary consequence for failing to report a blameless temporary mechanical breakdown. The second case involved a docking pilot in a New England port who allided with a railroad bridge and failed to report the incident to the Coast Guard. Sadly, but not all that rare, the pilot was provided with faulty draft information regarding the vessel he was piloting leading to the allision. No damage was reported by the pilot or the ship’s master to either the vessel or the bridge, and the assumption was ‘no harm, no foul’. Not surprisingly, the Coast Guard viewed the incident differently and, subsequently contacted the docking pilot advising him that he was the subject of their investigation into the unreported bridge allision. The investigation consumed over three months of interviews and paperwork before the Coast Guard concluded that the faulty draft information was indeed a major contributing factor to the incident, but while the pilot was not subjected to negligence charges or civil penalties because of the allision, he too received a Letter of Warning for not reporting the incident or submitting a written CG-2692 within 5 days of the casualty. This proved to be yet another costly ($4,900) and somewhat hollow ‘victory’ for the experienced pilot due to the issuance of the LOW. Clearly, the need to report marine casualties to the Coast Guard (and your license insurer if you have coverage) is critical. The consequences of not reporting can leave an unnecessary blemish on a professional mariner’s record that will follow him/her throughout their career.